As the society evolves, there is growing awareness about social evils like child labour and poverty. Modern society wants better treatment of fellow human beings, especially children and other vulnerable segments of the society. Business organisations all over the world (especially from the developed nations) are also realising their corporate social responsibility in eradication of child labour, forced labour, discrimination, poverty, etc. Many large organizations such as TESCO, WalMart, etc. have decided to clean-up their supply chain by asking their suppliers (especially those from developing nations and third world countries) to demonstrate their corporate social responsibility. They prefer to do business with SA8000 certified suppliers. What is SA8000:2014 ? It is an international standard on Social Accountability, published by the Social Accountability International (SAI) which is a non-governmental, international, multi-stakeholder organisation dedicated to improving workplaces and communities by developing and implementing socially responsible standards. Its headquarters is situated in New York, USA. The SA8000:2014 standard released in June 2014 replaces the SA8000:2008 standard. Both manufacturing companies and service organisations can implement SA8000:2014 and get certified. If you want to learn more about the standard and/or planning to implement SA8000:2014 in your organisation, you would find our training kit very useful. If your company is already certified to SA8000:2014, you could use this kit for imparting training to the new recruits. To understand the importance and relevance of social accountability. 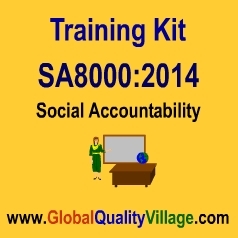 To learn the steps involved in the design, implementation and SA8000:2014 certification of a company's Social Accountability Management System. What is SA8000:2014, who issues SA8000:2014 certificate, Gantt chart of a typical SA8000:2014 implementation project, etc.